Why Should I Seal My Pool Coping? 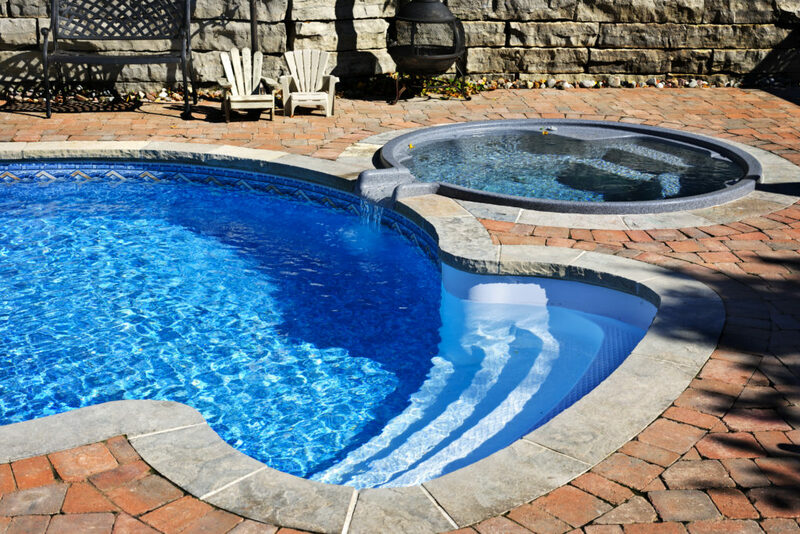 Many people create their pool coping with a natural stone material such as flagstone, limestone, travertine or quartzite as opposed to materials that were more popular decades ago like concrete and brick. All of these materials are vulnerable before sealant is applied, but once you seal natural stone coping or brick it can hold up well under even the harsh conditions. Knowing how to choose the appropriate sealant is not hard, we will walk you through the process step-by-step. Concrete or brick is also used in some cases and should also be sealed to protect your investment. If you’re using a concrete sealer, sealant for brick, or one for stone it should always contain a grit additive to prevent slips and falls around the pool and while entering and exiting. Safety first! On any given day, a pool coping is subject to alternating periods of wetness and drying out. As a result, water evaporates but leaves behind salt or chemical residue that from the water. Salt in particular has the potential to create costly damage to pool coping. Concrete, brick, and stone surrounding a pool endures periods of freezing and thawing cycles, causing expansion and contraction of the material. Even one cycle of expansion and contraction can cause damage, but repeated cycles can cause spalling, causing the coping to crumble, flake off into the pool and cause sand and sediment buildup. Additionally, calcium deposits resulting from the interaction of stone with salt or chemicals can lead to unsightly calcium deposits which can deteriorate your stone itself if they are not removed. Many types of stone are also subject to staining and/or sun damage, but proper sealing around the pool coping area can minimize or prevent these undesirable results. Sealers create an impermeable bond that prevents pool water from coming into contact with the pool coping material. When salt or chemicals are not able to enter the pores and/or small cracks in the stone, concrete and natural stone erosion is minimized or eliminated. Some materials are more prone to staining than others, but all natural stone is porous to some degree and is susceptible to staining from oil and other liquids. Sealers force liquids to “bead” and make them easy to wipe up before they can soak into the pores of the stone. Mold and mildew spores are basically everywhere in our environment but they can only grow in warm, moist conditions (such as those found around a pool!) Keeping moisture out of the stone with a sealer is the best way to prevent mold and mildew growth. If your pool coping is made of a natural material, calcium deposits may develop over time and lead to surface deterioration if not removed. The sun’s powerful rays also have the potential to damage your pool coping if it is not protected. Some color enhancing sealants can make the striations and marbling in natural stone or died concrete pop. Not only does sealant improve the appearance of the pool coping, adding grit additive to the coping sealer before applying it makes it safer by improving slip resistance. Lower the water level of your pool to prevent moisture from contacting any portion of the pool coping to be sealed. Determine if there is any old sealant partially remaining. Older sealant should be stripped and removed before you apply TSSPRO Sealant. You’ll need to use a professional cleaning product designed to remove water or oil based sealant, depending on which type had previously been applied. The product should be left in contact with the stone for the time period specified on the label, then agitated and worked into the surface before wiping and rinsing. Check for calcium deposits. If you find calcium deposit stains around the edge of your pool, a professional soda blasting treatment can remove them and protect your stone from further damage without harming the surface. With new installations, be sure to allow grout enough time to fully cure before applying sealant. Under ideal conditions, this may take as little as 24 hours but can take multiple days when humidity is high and/or temperatures are cool. Wash the entire surface of the pool coping with a professional cleaning solution designed for the material which composes your coping. In most cases, a cleaner with a neutral pH will provide the best results, but alkaline cleaners can be used to remove excessive stains or soiling. Thoroughly rinse the cleaner from the entire pool coping area. A garden hose or mop will work well; you can also use a pressure washer set to low for most coping materials, but check with a professional to ensure you will not damage the surface before starting. Remove excess water with a wet/dry vacuum or a clean cloth. Standing water left to evaporate has the potential to leave behind small amounts of dirt or debris which will prevent proper bonding between the surface and sealer. If any oil stains remain after cleaning, apply and work in a thick paste of commercial grad cleaning solution recommended for the type of material your coping was built with. Ther are formulas specifically designed to draw out oil from stone, concrete or brick. Allow the product to fully dry and cover with plastic wrap if necessary to protect it from moisture. Once dry, remove the powdery material with a stiff brush, then clean the area with the cleaning solution and method you utilized previously. Apply the TSSPRO Coping Sealer Recommended for your coping material and pool water. Pools and pool copings are significant investments that have the potential to provide decades of hassle free enjoyment if they are cared for initially. The harsh conditions surrounding pools can subject the pool coping to excessive damage if a sealer is not properly used and applied, but once the application is finished, maintenance is much easier. Prevention is always better than cure and will reward you with a beautiful deck that can be enjoyed for many years and gatherings to come.